I have a few students preparing to enter their first AKC agility trial - In the course of watching their adventure I'm remembering all of those little things I wish I had known before I entered my first trial all those years ago. This will be a multi-part series - starting with how to find and enter a trial. More information on the trial. Since we're discussing AKC trials - it's best to start there. On the AKC Events page there is a tool to search for trials - past, present and future (the past trials include results - which is a neat feature) by state. So if I'm looking for upcoming trials in New Hampshire, I'd search for Competition Type Agility Trials -> Time Range All Future Events -> Click on New Hampshire -> Search. Search results are sorted by month. Clicking on the name of the event will bring you to an event page with more information about the trial: Contact information, judge assignments, entry limits, etc. All of the entry information is right here - so it's possible to make an entry - even if you don't have access to the trial's premium. If you can't find the premium online (club or trial secretary's website), email the contact person for a copy of the premium. In addition to the information from AKC you'll see information on any trial specifics, special prizes, special events (matches/demos/health clinics), a list of hotels in the area that accept dogs and directions to the trial site. If you're planning to trial in New England or Eastern New York you'll also want to become familiar with the Paw Prints Trials website. Noreen secretaries most of the trials in this area. On her site is a list of trials for the entire year, opening and closing dates. When premiums are ready for release they'll be there as well. Noreen also posts trial confirmations, worker schedules (more on those in part two) and event results after the trial has finished (usually posted on the same day). 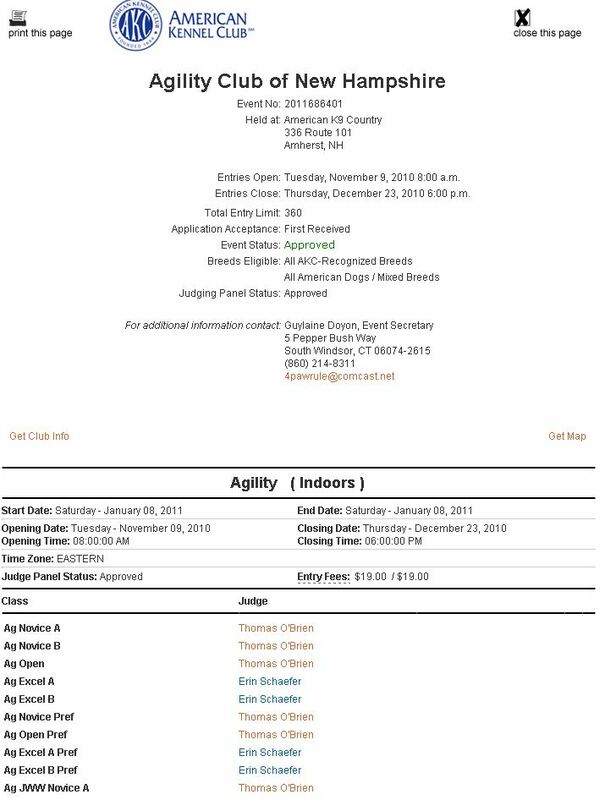 All entries for AKC trials have to be on official AKC entry forms. There are always copies of entry forms in the premium - but you can also use a generic entry form off the AKC website - or you can use an entry service (like Oaklines) that pre-populates and fills out entries for you. You'll need to figure out total entry fees for the trial as well. Most trials in the Northeast have two or three class fees - one for first run, one for second run and if there's a third run there might be a further reduced entry fee. What does that mean? First entry is just that - your first entry of the day (standard), the second discounted run would be JWW and if the trial was offering fast that would be a third run. As of October 2010, that third class is FAST (Fifteen and Send) but in the future clubs will have another titling class called "Time to Beat" (T2B). When I entered some trials in Virginia I noticed that clubs down there don't have discounted second entries - it's $X per run, typically with a package deal for the weekend which saves the handler $5/per dog (or so). In the "more information than you really need to know" category - AKC charges the host club first an event fee that's per day of a trial and secondly a fee per dog for each entry. The total has changed a bit over the years (up and to include second and third entries), right now it's $3.50 per run or class to the AKC. By the way, I can't tell you how much I love Oaklines; I use it for all my entries: obedience, rally, conformation and agility... All I have to do figure out the total entry fees, plug the name and date of the trial into the form, then print, sign and mail! I also take a moment to save the pdf so that I know what I entered and when.... It's great for a sanity check: "did I enter FAST for the ACNH trial?". You'll need to fill out your form completely - any missing information does not constitute a valid entry - make sure you sign for form!!! For ILP/PAL/Canine Partners you don't need to list a sire and a dam - but you will need to put something in that space - I'd imagine most folks list "Unknown". You may send up to ten dogs in one envelope - more than that and all of the entries will be refused by the secretary. It's a good idea to split overnight fees with your friends - but keep track of how many entries you're sending in that envelope. For AKC trials there are two methods of accepting entries "first received" and "random draw". First received is just that - entries are taken as they arrive at the secretary's home - in the order that they are received until the trial is filled. For one ring (330 run) trials in a popular area you'll likely have to overnight your entry to get into a trial. For the trial secretary this often means a HUGE crush of entries on opening day. The other method of accepting entries is "random draw". There is a draw period - typically a few weeks - where any entry received in that window is counted and sorted. There's a date when the draw closes - after which there is a drawing for entry spots (which should be random). This method is a lot more user-intensive than first received - but there's an advantage that clubs may hold a few 'slots' for their workers - thus guaranteeing their key workers (whatever the club determines to be key) a place in the trial. No one wants to put all the work into chairing a trial and then not get into the trial! In New England I can only think of one club that still offers random draw, instead clubs are taking responsibility to overnight the entries of their key workers to ensure their entry into the trial. Whatever source you use - the information for opening and closing dates should be the same. The opening date (and time) is just that. Entries received before the opening date and time will be returned - so if a trial opens on October 5th at 10am and your fed-ex overnight mailer arrives at 8:36am that's not good (though I have a suspicion that most trial secretaries just wouldn't check their mailbox until after 10am ). You'll become familiar with your regions postal cycle - and how long it takes for mail to get to the trial secretary. I've found that an envelope dropped at the distribution center (not post office) before 2pm will get to Mass overnight. An overnight express mail envelope will get to Mass overnight (arrives at about 10:45) dropped at my local post office any time before 4:45pm. You'll see another important date on the premium - that's the closing date. That's the date up until which you can pull from the trial and receive some (or all) of your money back. That's also the last date that you can make any changes to your entry (regular to preferred or A to B). Do not confuse this with the cut-off date for move-ups. Closing is typically 2-3 weeks prior to the trial. Until September 1st, 2010 the closing date was the closing date. AKC has made some changes to allow clubs to hold a few entries on the waitlist and fill for a short period after closing. So if spaces open up they'll fill from the wait-list. This second "closing" date is usually about a week from the trial date. Some clubs will cash checks of that short wait-list and then refund monies if that handler doesn't ultimately get into the trial. Most trial secretaries will send out an email confirmation that your entry was received, that you have a space in the trial (or you are wait-listed) and confirms your class entries. Do yourself a favor and check this carefully. Make sure you are entered in the correct classes for the correct trial. If there are any problems, don't be bashful about sending the secretary a note and correcting them. Many trials have a little coupon sized piece of paper in their premium that asks for volunteers for the trial. All trials run because of volunteers - scribes, ring crew, course builders, gate stewards, timers, leash runners, etc - it really takes a village. 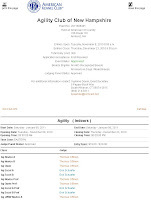 Over the course of your agility career you can learn to do all of the jobs. Anyone can start as ring crew (bar setting, chute fluffing, etc), leash running or score running. Most clubs will buy you lunch for working and provide some raffle tickets for some good prizes. If nothing else volunteering will introduce you to all kinds of people! You can enclose this paper with your entry or you can sign up at the day of the trial. Some trials are moving towards google docs to schedule workers - posting a spreadsheet, enclosing the link in the trial confirmation letter and asking volunteers to plug in their names for into classes they want to work. This saves a lot of work and hassle - especially for those two ring trials when it's impossible to be two places at once. All AKC premiums should include information on local hotels that accept dogs. Some clubs and facilities have negotiated special rates for their event - keep this in mind when booking hotel rooms. Do investigate the area though - clubs don't list all the options and with a little sleuthing you might find a better option. I'm a loyal red roof customer. I appreciate their rewards programs (who doesn't love free nights!) and I find that while Red Roof is an inexpensive hotel chain they are consistently safe and clean. Motel 6's universally accept dogs as well - but I've stayed in a few that have put me off the chain entirely - for a few bucks more at the Red Roof the towels are softer and there are fewer permanent residents and party-goers. If I'm trying someplace new I'll check the address in google maps to be sure that there are grassy areas where I can walk my dogs. I used to seek out the mom and pop motels because I could almost always get them to accept dogs - I've stopped going that route now with the increased bed bug activity. Not that the mom and pops aren't clean - just that if there's a problem it's almost prohibitively expensive to get rid of bed bugs - I think a 200 bed Red Roof has a stronger bankroll to scrap everything and clean it up, than Mom and Pop's 10 room motor inn. I was also finding that the Mom's and Pop's weren't all that clean sometimes. While I'm still shuddering at the topic of bed-bugs - check out the Bed Bug Registry. If you stay in a hotel/motel - PLEASE, PLEASE, PLEASE pickup after your dogs. The dog owning population can be a pretty gross lot of people - it's not that hard to plan ahead with bags and be a good citizen. In the event that you needed more incentive, when you are traveling for a dog show hotels are considered to be show grounds. If you are an exhibitor and you are caught/noticed not cleaning up after your dog, or leaving a damaged room without making restitution with the hotel you are in violation of AKC rules. A hotel establishment could (should) call the trial organizers and report the incident, there would be an event committee hearing and you could lose your AKC privileges. Most of the hotel staff doesn't know about this rule so it's not often enforced - but more and more trial chairs are calling the hotels in advance and providing their contact information - it's just the right thing to do. In Part Two of this series I'll discuss what to pack for your first trial. Part Three will cover what to expect when you arrive on trial-day!